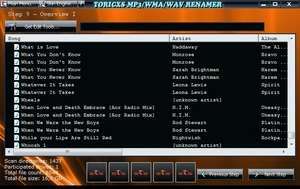 Toricxs is a tool to clean up the appearance (file name/tag) of your Windows Media Audio (*.WMA), mp3 and wav files. You insert your music file and out comes an automatically well-formatted wma/mp3/wav collection. For security reasons, you should also check out the Toricxs download at LO4D.com which includes virus and malware tests. Additional screenshots of this application download may be available, too.